The location was at the entrance to a very nice moderately priced hotel in Rockville, Maryland. The "Take It!" came from my shifting my focus from the hustle of moving as quickly as possible early in the morning while engaging in the running of the routes that I do for a job ( I hasten to add - it is a great job that I have been doing for over 17 years. The people I work for, are the best ). At this point in the day - the object is to cover as much ground as possible to get ahead of the morning commuter traffic. Thus, many times I do not give myself time to take in things that are part of backgrounds. What I see at this time of day has to jump out at me. 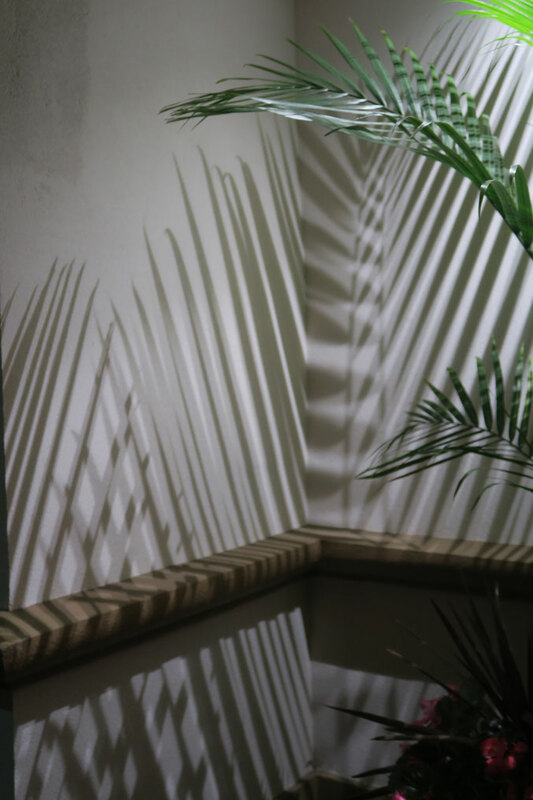 This shadow arrangement is one that can change as the featured palm is in a container that is on wheels and is in an alcove next to the front door. The overhead light casts the shadows and on this particular morning, I think the groundskeepers may have moved the plant as the shadows were so much more profound. The After Take: This one earned many appreciative comments, not of the "wow" nature - just like me - happy that this soothing photo had been taken. I have to tell you that there is another alcove with a similar palm in it on the other side of the entrance that is not any where near as photogenic - lol. This is a tribute to taking just a moment to really look at what is presented to us. Sometimes there a treat in the offing. Wishing everyone a fine day. The criss cross there in the middle looks very cool! 3:20am!? Wow, that is crazy early! Is that the beginning, middle or end of your day? The leaves going against each other on the left side of the photo looks like a camp fire or a teepee. Pretty cool!! 17 years is a pretty good stretch. Has it always been that early in the AM?